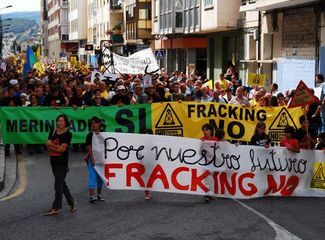 On 11/03/2011, the Company Trofagas Hidrocarburos (now BNK Petroleum Inc.) was granted a licence for study the feasibility of a proposed fracking for a period of six years through the so-called Urraca Licence (BOE 11/03/2011). BNK Petroleum Inc. is a private company of site in Camarillo (California) within the Ministry of Industry of the Government of Spain. The license involves territories in Euskadi and Castilla y León, affecting a total of 95,000 hectares. The Garoña Nuclear Power Plant (43 years old) has placed near the 12 Urraca wells (20 km. ) .